I was just interviewed by the blog 100 Scope Notes. Travis Jonker my interviewer is an elementary school librarian since 2005, started 100 Scope Notes in the golden days of 2007. 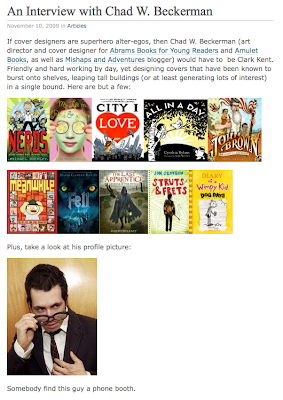 In addition to posting children’s literature reviews here, Travis also periodically straightens his tie and reviews for School Library Journal, and has been a judge for the Cybils Awards. Hope you enjoy the interview it was a lot of fun to do. Good thing you have a side-kick. Came over from the interview and I wanted to share with you how much I love the cover for NERDS! Everyone I have shown it to thinks it looks incredibly fun--and that includes the guy at the sub shop, who picked it up when I'd gone fishing in my purse for change. Wonderful job! Thanks HL! I am about to start on the cover for book 2. Can't wait! Great interview! I saw a kid at my daughter's elementary school carrying around a copy of the Wimpy Kid... so cool to think that you are reaching kids everywhere! Wonderful interview. I also enjoy the "behind the scenes" looks at designing a cover, being both an illustrator and designer. Always a favorite stop of my blog roll. Good stuff! As always, I covet your job. Except I am not in the slightest bit artistic! Instead I shall just enjoy your blog.